The Expo Construction Authority and it’s construction team are predicting a “Summer 2015” opening for the Expo Phase II Bicycle Path. 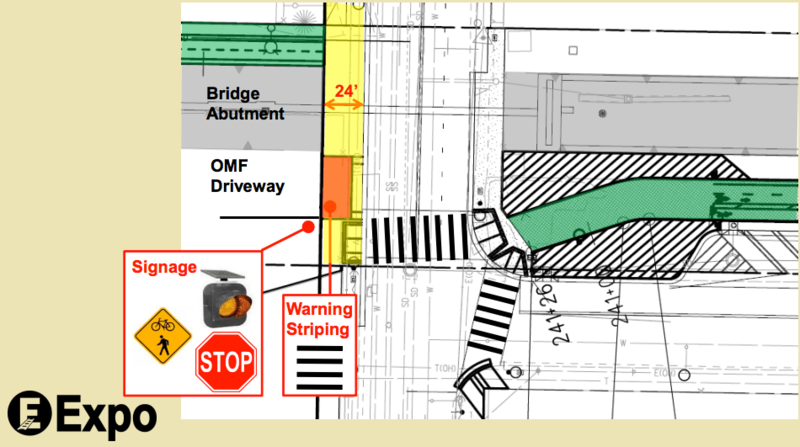 However, there are still some controversial areas in the path design, some intersections that members of the Bicycle Advisory Committee feel are unsafe. One of the major remaining issues is the design of the intersection of Centinella and Exposition. Current design of the bike path has cyclists crossing a crosswalk, riding on the sidewalk in front of a maintenance yard driveway, and then turning back onto the path. The driveway was moved as part of a compromise with local homeowners who feared the maintenance trucks for the Expo Line would blight the local streets. Further complicating issues, the east side of the intersection is inside the City of Los Angeles. The west side is City of Santa Monica. The crossing also requires that the bike path move from the south side of the rail to the north side. In one of his last acts as City Council Transportation Committee Chair, Bill Rosendahl is seeking a way to fix that problem. A motion, co-sponsored by Council Member Paul Koretz, asks LADOT to prepare a report on different ways the City of Los Angeles can foot the bill to fix the intersection. Staff for Rosendahl and his successor, Mike Bonin, confirm that fixing the intersection is a priority for the incoming Westside Council Member as well. “Any greater assurances that we can implement the design preferred by the Expo Bicycle Advisory Committee at the Centinela path crossing would be quite a relief,” writes Gary Kavanagh, one of the B.A.C. members for the City of Santa Monica. Advocates and Advisory Committee members remain adamant that the overall design should be changed so that there is no conflict with the driveway. In the meantime, staff is working on making the conflict zone as safe as possible without moving it. OMF stands for operation and maintenance facility, i.e. the facility with the driveway in question. For reasons beyond the understanding of members of the Bicycle Advisory Committee why the fixes needed to make the safest crossing are not being paid for by the Authority. For its party, the Authority claims the City of Santa Monica demanded the changes from the original maintenance yard drawings, so any bikeway fixes required should come from Santa Monica. Santa Monica disagrees with that interpretation of events. Regardless, the Construction Authority’s contractors, Skanska-Rados, estimates that the cost of redesigning and constructing a transition through Centinella that avoids the driveway would be $845,000. Given the high budget for the bike path, Metro spokespeople confirm a shocking $16.1 million budget for a 6.6 mile path, it seems that funding could be found if fixing the intersection were a priority. If I were empowering an advisory body, I would give them a more detailed budget than this. Of course, I'm not running the Expo Construction Authority. While the Expo Construction Authority, LADOT, and the City of Santa Monica work to scrounge up less than a million dollars for the bikeway, the Expo Line Phase II is being used a a piggy bank for the 405 Widening Project through the Sepulveda Pass. Page 12 of this Metro staff report shows how $56.25 million will be shifted from Expo Phase II to cover overruns on the 405 widening with a positive vote at tomorrow’s meeting of the Metro Board of Directors. Metro spokesman Dave Sotero confirms that the budget transfer is just temporary, that the money for Expo will be returned before it is needed to be spent on the line. “…the funding transfer out of Expo will be restored to the Expo Budget from a different funding source. The project is not running under budget, nor is it over budget,” writes Sotero. But think of hos much the interest from that money could do for the Expo Bike Path, an actual companion project to the Expo Bikeway. It’s almost enough to make you wonder if maybe the gigantic, overdue, costly, wasteful, unnecessary, widening project is Still Totally Worth It. What does the alternate transition through Centinela look like, that avoids the driveway, and would cost $845,000? Does it have its own problems, beyond cost? The city only has rough sketches, and we’re working on getting a copy. I wanted the story to publish before this afternoon’s hearing because with a loaded T-Comm and tomorrow’s Metro Board, I wanted to make sure it had at least one moment as the lead. Of course, I imagine two of the three Council Members involved aren’t thinking about bike paths right now. Why is the driveway ramp split into two with small curb in the middle? You would think having a 180° ramp would be logically safer. Have the people who designed this crap ever ridden a bike? Look at the turning radius on those ramps….terrible.